2.1 How many USB ports does Pandora have? 2.2 What does “host port” mean? 2.3 What does “OTG” mean? 2.4 What’s all this stuff about USB 1.1 and USB 2.0? Isn’t USB, uh, universal? 2.5 So which devices are which? 2.6 Arrgh, USB used to be simple. What can I actually connect to Pandora? If you have a question to ask, that isn't covered in this FAQ already, please ask over on the Forums. How many USB ports does Pandora have? What does “host port” mean? A USB host port “hosts” any device that you plug in, just like the USB ports on your computer. 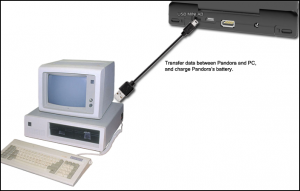 Pandora’s full size USB A port can host USB 2.0 devices (only if they are high speed compliant! ), and provide up to 500mA (the maximum allowed according to USB standards). OTG stands for On The Go. USB OTG ports can operate in two different modes. When connected through this port, the Pandora can act as a device, for example when connected to a computer for charging & data transfer. For this mode, you need a standard-A to mini-B cable. However, the Pandora can also act as a host port for USB 1.1 and USB 2.0 devices. For details on how to make the necessary cable connection, see the OTG host mode section. This port can supply a maximum of 100mA in host mode. Although this port implements On The Go functionality, it can not get an official On The Go certification because the OTG specification requires a device to have exactly one USB port. (The Pandora has two.) Also, the mini-AB connector used on the Pandora has been taken out of the specification in 2007 (but is still widely adopted). What’s all this stuff about USB 1.1 and USB 2.0? Isn’t USB, uh, universal? USB 1.1 is a subset of the USB 2.0 protocol. Among many other things, the USB 2.0 standard introduced high-speed data transmission, which requires a special controller on the host side. Most USB ports (eg. on your computer’s motherboard, in USB hubs) actually contain two chips to allow universal compatibility – one that takes care of the Low-Speed (1.0 Mbit/s) and Full-Speed (12 Mbit/s) devices, and another one for the Hi-Speed (480 Mbit/s) devices. The reason is that Low-Speed and Full-Speed are essentially the same protocols operated at different clock frequencies. Hi-Speed is a completely new development and nothing like the other two. For reasons beyond our control, Pandora’s USB standard-A host port does not contain this second chip. Only USB 2.0 devices bearing the “USB HI-SPEED” logo can be plugged directly into this port. However, USB 1.1 devices can be connected to this port through a USB hub, provided the hub bears the “USB HI-SPEED” logo. So which devices are which? Common Low-Speed and Full-Speed devices include keyboards, mice, headsets, older USB devices. Common Hi-Speed devices include cameras, PMPs, HDDs, hubs, card readers, thumb drives. This is just a rough representation of what’s out there in the wild, and you will find exceptions. Devices like HSDPA modems and GPS units could fall into either category. The only reliable indication of true Hi-Speed compatibility is the “USB Hi-Speed Certified” logo (right). Arrgh, USB used to be simple. What can I actually connect to Pandora? Almost anything, as long as it's supported by Linux. Think of a USB device that everybody uses (mouse, keyboard, thumb drive...) and chances are it will be a simple matter of plug and play. But this might not be the case for more specialised USB devices (modems, ethernet adapters, USB displays...), many of which will only function with Windows specific drivers. 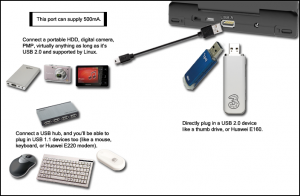 If you intend to purchase USB accessories for use with Pandora, you should first research Linux support for that type of device. Devices already tested on Pandora will be added to the USB compatibility list. To enable data transfer for SD cards, run SD-Mass Storage (in the System category). Charging Pandora from your computer's USB port is best done with Pandora in standby mode. The current provided by your computer will probably not be sufficient to provide a quick charge while Pandora is being used. There are USB standard-A to mini-B cables that can be used to charge your Pandora but don't work to transfer data to/ from the Pandora! MSWindows will complain abount "An unknown device connected". Try using a different cable. Directly plug in a Hi-Speed USB 2.0 device such as a thumb drive, or a Huawei E160 modem. 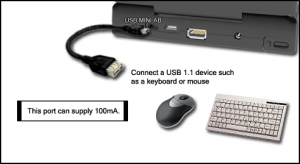 Connect a USB hub, which will enable you to to connect other non-Hi-Speed USB devices such as keyboards, mice, or a Huawei E220 modem. This port can supply a maximum of 500mA. If you plan to use a USB HDD, note that very few of these can draw sufficient power from a single USB port. A powered HDD caddy or powered USB hub will be necessary in most cases. How you connect a device to the mini-AB OTG port depends on the device's USB connector. This port allows you to connect any USB 2.0-compliant device (Hi-Speed, Full-Speed, Low-Speed, including USB 1.1 ones) directly, without the use of a hub. 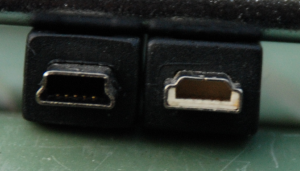 mini-A and mini-AB connectors have been removed from the present USB standard. This means that the above connectors may vanish from the market at some point (although there will probably be demand for them for some time). There are a lot of connectors available that were never standardized. It is recommended that you do not use them as they may lead to non-working connections. Stick to the cables and adapters mentioned above and look for a mention of "OTG" or "On The Go" and you should be on the safe side. In host mode, this port can supply a maximum of 100mA. USB 1.1 devices that draw more than 100mA will need to connect to Pandora's other USB port via a hub, as depicted in the previous example. The Huawei E220 is one such device.